On April 10, 2019, the cryptocurrency exchange OKEx announced that its IEO was sold out in just one second. While this seems like an astonishing performance at first, we’ve found that there some controversy around this token sale. The controversial Blockcloud token sale was launched at April 10, 13:00 (CET) on the cryptocurrency exchange’s IEO launch platform, OK Jumpstart. Users had to hold at least 500 OKB daily (with 2,500 OKB for maximum contribution) for seven days before they could subscribe for the Blockcloud IEO. The subscription period was planned to last a maximum of 30 minutes. However, OKEx tweeted that the over-subscription limit has been reached “within only a short time,” so the subscription period ended in less than 30 minutes. “All $BLOC sold out in 1 second. The BLOC/OKB spot trading market will open at 15:00 today (CET),” the cryptocurrency exchange stated. If we assume that this statement is true, OKEx would have set a record among all token sales, including ICOs and IEOs, beating Bittrex’s VeriBlock (10 seconds) and Binance’s Fetch.AI (22 seconds). “How can you win in one second lol… Botland. Gladly will stay away from all these IEO’s,” one disappointed user replied. Another stated that “it took him three seconds just to read OKEx’s tweet, possibly referring to that it would take him much longer to contribute to a token sale.” And claims that the contribution button was never turned active. It seems like OKEx had set a goal to maintain BLOC’s launch price. The following screenshot was taken shortly after the price launch. 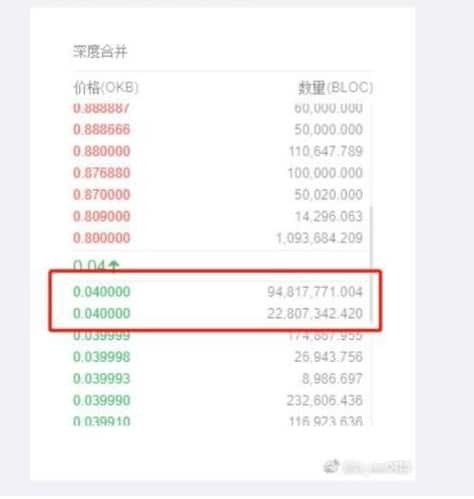 Clearly see the large blocks of demand around 0.04 OKB per BLOC. While the token’s sales one second sold-out raises the question of whether or somehow the token sale was manipulated, the cryptocurrency exchange seems to be very proud of the results. 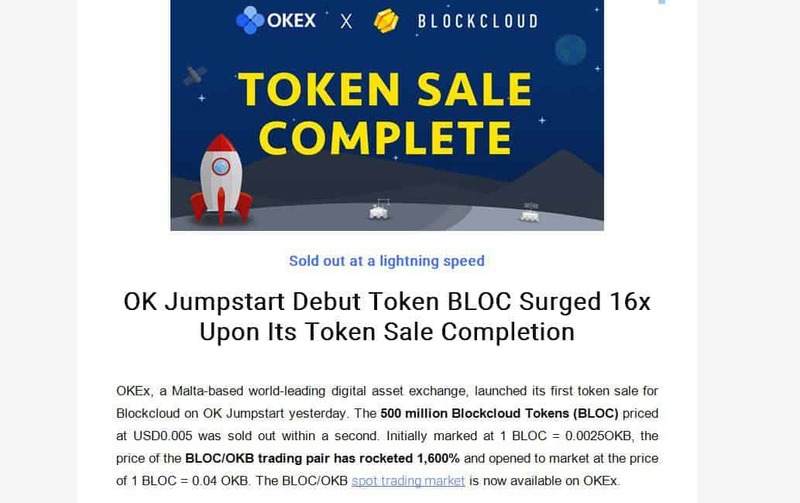 So proud, that OKEx did even include the 1,600% surge of Blockcloud’s token (BLOC) in an email to the community, something odd for a crypto exchange. We had never seen Binance formal announcement including BNB’s price change. We’ve found one additional dubious fact about the OKEx token sale, which is the fluctuations in OKB’s price, the native token of OKEx exchange. Like other exchanges running IEOs, OKEx has set rules around the Blockcloud IEO that required participants to hold at least 500 OKB before subscribing. 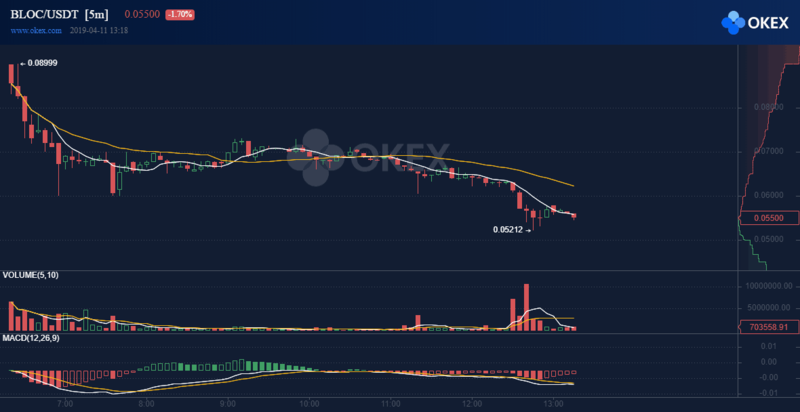 OKEx’s native token had dropped from $2.41 on April 4 to $1.87 by the time of the token sale on April 11, which is roughly a decrease of 22.5% in those seven days. As of writing this, the price of OKB is $1.52, approximately a 37% decrease from the price recorded on April 4. On the contrary, Binance’s BNB has surged 60% over 30 days before a Binance Launchpad announcement with no slowdown for the price increase. Huobi that had its first IEO on March 26 experienced an increase of over 88% in its native HT token from March 1 until the date of the token sale. Needless to say, since started trading, BLOC had lost around 40% of it’s value aginst USDT. A recent volume research had found out evidence that OKEx is one of the most-known exchanges with a significant difference between their reported trading volume to their actual volume. In September 2018, it was reported that OKEx founder Star Xu was released from his arrest in Shanghai. According to the reports, Xu was aiding the police in an investigation into investors’ accusations that the cryptocurrency exchange had manipulated Bitcoin futures on its platform. “Lastly, regarding the recent allegations that our Founder, Star Xu was arrested, that is fake news. What is impressive these days is that there is minute-to-minute coverage about events in the crypto space,” Byun said.